Asustek Computer introduced a new "phablet" device called the Asus Fonepad Note FHD6, which is part Android phone, part tablet. The 6-inch phablet can be used for 3G phone calls, or to watch full-HD movies on its 1920 x 1080 pixel display. "It's a perfect balance between play, work and social activities," said Jonney Shih, chairman of Asus, during an entertaining news conference at Computex during which many new tablets and PCs were introduced. The company did not say how much the FHD6 will cost or when it will go on sale. The phablet has an Intel Atom Z2560 chip code-named Clover Trail+, which runs at 1.6GHz. Clover Trail+ was originally meant for smartphones, but is being adopted for tablets. The chip is also being adopted by Samsung Electronics for its next Galaxy Tab tablet with a 10.1-inch screen. 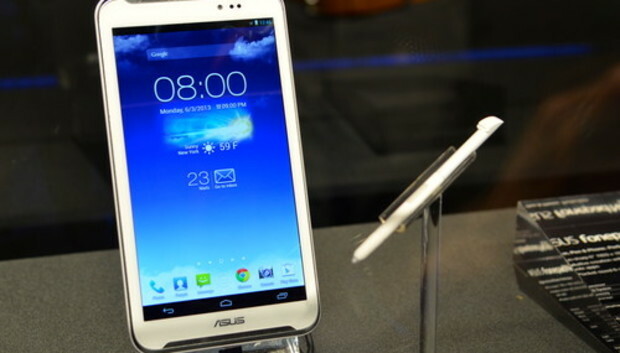 Asus earlier this year introduced the Fonepad 7, which is a 7-inch "phablet" also capable of voice calls. The Fonepad Note has an "incredible narrow frame" so the device can fit easily in the pocket, Shih said. Other features include an 8-megapixel rear camera and a 1.2-megaixel front camera. The device has front-facing stereo speakers. A competitor to the Fonepad Note will be Samsung's popular Galaxy Note II, which has a 5.5-inch screen. Like Samsung, Asus is filling up its tablet and smartphone line with products sporting screen sizes between 4 and 10 inches. The Fonepad Note may not be LTE compatible, partly because Intel does not package an LTE communication chip with its tablet and smartphone processors yet. However, Intel has said it will ship LTE products next year.